What are the Best Ways to Bind Documents Without a Machine? If you're wondering what the best ways to bind documents without a machine are, you have come to the right place. 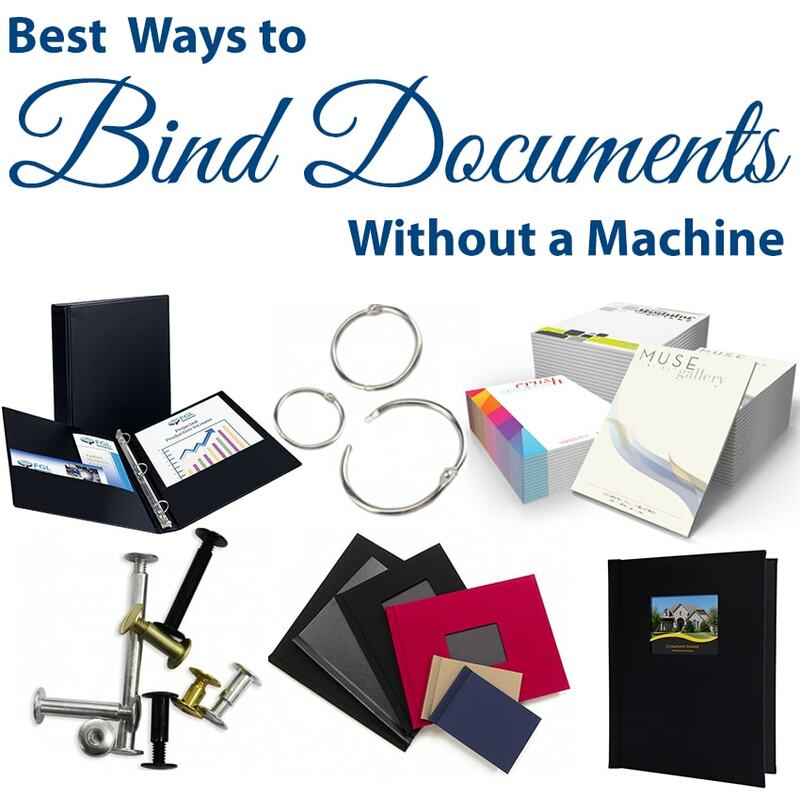 We have compiled a list of the top 7 ways to document bind without having to buy a binding punch machine, so you can produce bound books, reports, and more without spending a bunch of money on equipment. These awesome ways to bind without a machine include everything from traditional hard covers, to ring binders, to notepads, to spiral binding coils, and more. Pinchbooks are these awesome hard covers that you can bind without a machine; you just open up the covers all the way, slide in your pages, and then close the covers again. A patented spine holds tight onto your sheets, with loosens as you open the cover past the flat position; this means you can edit your bound documents as many times as you want! Pinchbook hard covers are becoming more and more popular for all kinds of businesses, as well as individuals, because they have very small minimum orders (just 1 box, which has either 5 or 10 books, depending on the size), are affordable, and don't need a machine to bind. Real estate agencies are using them to make stand-out home and land sale books, businesses are using them for high-end presentations to clients, non-profits are using them for donor presentations, elementary schools are using them for classroom yearbooks, photo studios are using them for on-demand photo books, and more! Looseleaf binding rings are another great way to bind loose pages together into a bound document without having to buy a machine. They fit into standard punched holes, so all you have to do is pull the rings open, put them through the hole, and then close the rings. The closure type comes in many styles; snap lock, screw lock, and even overlap. Plus we also have book rings in metal and plastic materials, as well as ring sizes to handle just a few sheets up to 10" thick! Document binding with binder rings is easy, fast, and incredibly affordable, since the rings are so inexpensive. You can use 1 ring, or many rings for your books, and you can even use them for fabric swatches, hanging displays, and more. Screw posts are a popular document binding method that doesn't need a machine; just a standard hole punch. They have two-pieces that are screwed together to hold your pages. Aluminum screw posts and steel screw posts are easily screwed together and unscrewed, as needed, so make a great choice for documents that need to be edited. There are also plastic posts that are snap-lock and pressed closed, creating a tight bind that is harder to undo, so considered semi-permanent. Also called Chicago screws, binding posts are incredibly popular for individuals, business, architecture firms, and even photo studios. If you're doing high volumes, you can pair it with a paper drill, but it is not a requirement by any means. Three ring binders (or any ring binders, for that matter) are a traditional way to bind pages without having to use a machine. Just pair with a 3-hole punch of your choosing for a perfect way to bind loose leaf sheets. There are stocked view binders in a huge variety of colors, poly plastic binders in several thicknesses, and even custom printed ring binders for a personalized look. Don't forget to pair those binders with index tab dividers to organize your sheets. Did you know you can do coil binding without a machine?! All you need is some pre-punched coil paper, pre-punched front covers and back covers, the coil binding spines, and some hand held cutter crimper pliers. Since the covers and paper are pre-punched with all those tiny round holes, you don't have to spend the money on or hassle with a punch machine. Just roll your coils through the holes, and then crimp the ends in with the pliers. Staples are one of the most common ways to bind documents without a machine...although, of course, you technically do need a stapler. But this isn't the traditional punch-and-bind, so people often don't call a stapler a "binding machine". The cool thing about staplers that you may not know is that there are many different kinds; standard staplers, flat cinch staplers, and saddle staplers, which will bind your book on a spine of a folded stack of pages. This mimics the look of a saddle stitched book, but without the machine. Notepad binding (padding) is another great way to bind pages together without a machine, though there are presses and automated machines that will get the job done for high volume users. Padding pages together only requires a few tools: your paper, a clamp, padding glue, and a brush to apply the glue. You just clamp all of your sheets together tightly, apply the glue, and then remove the clamp once the glue is dry. It is that easy!